Jack Grealish really is public enemy number one with Birmingham City right now! Not only did the Aston Villa star get attacked by a fan before going on to score the winner in this derby, he even attracted the anger of a steward in the stadium during the celebrations of his goal. 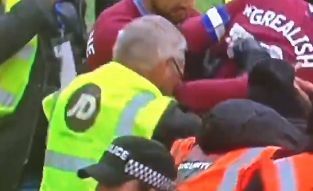 Watch the incidents above as the steward appears to both kick and shove Grealish as he and his team-mates celebrate by the travelling Villa supporters. He’s then dragged off by police for his troubles, as the idiot fan was earlier in the match. What an absolutely bonkers derby game this was in the Championship today! CLUB STATEMENT: Birmingham City Football Club would like to apologise to Jack Grealish and Aston Villa Football Club for an incident in this afternoon’s derby match.